Bedroom wardrobe- ideal furniture because it holds everything you need and does not occupy much space. It also allows you to create an atmosphere of comfort and tranquility necessary for a relaxing stay. If you decide to purchase this piece of furniture in the bedroom, think about its design better. First of all, you should determine the size of wardrobe. You need to decide where you want to put it, and then use the tape measure to make the necessary measurements. In addition, you must choose the most appropriate design. Distinguish housing (prefabricated), corner and built-in wardrobes. In the case of models there are: sliding door, rear and side walls, ceiling, floor. The main advantage is that if necessary they can be moved from place to place. Corner wardrobes allow you to use the unused corner space. They are both ergonomic and roomy. But the most popular type of wardrobes are built-in models. Due to the fact that they significantly help to save space, you can install them almost anywhere in the bedroom. However, the built-in models have a drawback: they can not move from place to place. A small bedroom is better to install built-in or corner wardrobes that are compact in size. Thought should be given to the internal design of the wardrobe. For example, you need to determine how much you will need shelves, partitions, drawers and how to best position. Do not forget about the material from which shall be made the next piece of furniture your bedroom. Furniture designs for bedrooms can have the wood trim and lamination. There are also options of wardrobes with finishing of natural materials — rattan, veneer. It is desirable that the wardrobe came in color to the rest of the furniture. This will create a sense of unified style in the interior of the room. Ideal – if you can purchase a set of factory: wardrobe and dresser, and a bed, made of the same material. However, in some cases, allowed the deliberate creation of the effect of fragmentation. For example, it refers to avant-garde and eclectic styles. As a rule, for the bedroom out bright and muted shades to create a tranquil atmosphere. Light color furniture visually expands the space. Beige, white, sand, pink and other soft shades allow you to make the interior of freshness. 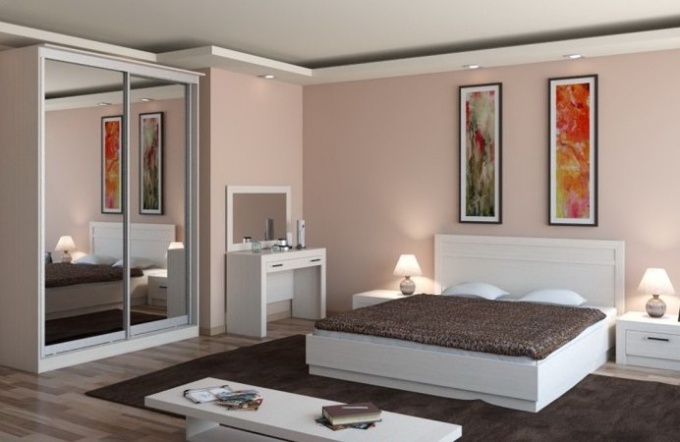 For bedrooms great option are closets with fully mirrored doors. This is convenient because you will have a full-length mirror, as well as those that visually increases the space of the room. Today it is fashionable to decorate a mirrored Cabinet doors different images and drawings. A special atmosphere of comfort and celebration will allow you to create a lighting system for wardrobes. If installing mirrored doors impossible, you can choose the color of veneer wardrobe in the tone of the walls of the room. In this case, it will be virtually invisible, and therefore not create the impression of awkwardness in a small room. The bedroom should be calm and quiet, and then all the accessories of the Cabinet should run silently. This point also must be considered. Closets easier to buy ready-made and to order. Furniture company engaged in the manufacture of cabinets to order, provide their clients with the services of an expert designer. It will specify the size of the bedroom, its layout, the nature and amount of the things you intend to store in your wardrobe, offering a range of options for its location in the room. Also, the designer will discuss with you the desired appearance and design of the interior and other details. In some companies, furniture the cost of metering, the consultation of the designer, Assembly and installation are already included in the price of the product. You may need to pay for shipping and for lifting furniture designs to your floor. The Assembly of the construction, start with the installation the bottom. From below, install the legs of the Cabinet and secure them with screws. Using a level, it is necessary to control the correctness of the actions. Next you need to attach to the ceiling side. The obtained P-shaped structure set on the base and secure using konfirmatov. Then install the rear part of the structure, and then the corners for shelves, drawers, and shelves. Doors should be set in design in the last turn. It is necessary to align the outer edge of the aluminum rails and attach them top and bottom with screws. Door insert for one: you have to start at the top aluminum rail top, and then in the lower guide - lower part. The same actions produce the second door. Everything your wardrobe for bedroom collected.